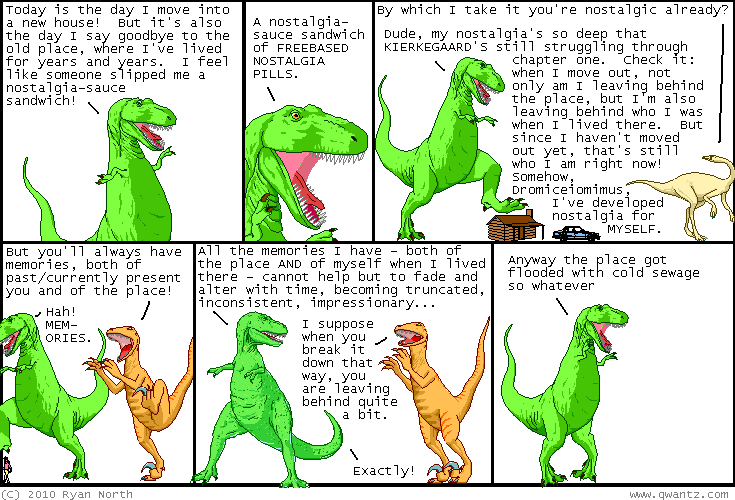 Dinosaur Comics - April 29th, 2010 - awesome fun times! April 29th, 2010: This comic is based on a true story from a few years back, in which the first apartment I ever lived in in Toronto got flooded with poops. It was SO GROSS, and what you can't see there is that I've written the word "SO" eighty times, each on top of the other. What - what I'm trying to convey is that it was really gross? Tomorrow and Saturday I'll be at MIT for ROFLCon! ROFLCon is an awesome/incredibly surreal time, being as it is the internet in one giant room. I've not got any panel duties this year, but I'll be wandering around saying hi (look for the tall, oh-so-handsome Canadian) and I'll also be at the TopatoCo table from 11-12 on Saturday too. The guest list is impressive, and I'm most excited to meet Rob Cockerham of Cockeyed.com, which is one of my favourite sites from way back, and the Autotune The News team, which is one of my favourite things from JUST THIS VERY YEAR.